Ultima III: Exodus was developed by Richard Garriott (aka Lord British) and published by Origin Systems. Originally released in 1983 for the Apple II. It was later released in 1988 for the Nintendo Entertainment System with a few modifications. These changes included vastly updated graphics and sound, more NPC dialog and changes to the user interface so that it worked better with the NES gamepad. After Ultima II took place on Earth, Ultima III returns to the land of Sosaria where the player's goal is to defeat the game's antagonist and namesake, Exodus. This is also the last Ultima game produced before the introduction of the Avatar and the Eight Virtues that were used in every installation since. Instead of a single protagonist in Exodus, the player controls a party of four heroes during his journey. At the beginning of the game, you have to create a party of characters. The character customization is pretty in-depth for a game this old, allowing you to choose from multiple races, classes and stat point distribution options. The stat points include Strength, Dexterity, Intelligence and Wisdom. Strength obviously governs your ability to deal damage; dexterity governs your ability to hit enemies, avoid being hit by enemies, and your chance to steal and avoid traps; intelligence governs your ability to cast magic spells and the maximum magic points of classes reliant on intelligence; and wisdom governs your ability to cast will power spells and the maximum magic points of classes reliant on wisdom. The races include Human, Elf, Dwarf, Bobbit and Fuzzy. The Human, like in most games, is average all around and can obtain a maximum of 75 points into each stat. Jack of all trades and master of none, he works well for hybrid classes that are good at a little bit of everything - but usually one of the more specialized classes is a better option even for hybrids. Your probably going to have your hybrid doing one thing specifically, and a little bit of everything else. My hybrid character, for example, is usually a Bobbit Paladin or a Fuzzy Lark (often both), and I rarely bother with the average Human characters. The nimble Elf can have the most dexterity with 99 but can only have 50 wisdom maximum to offset this. An obvious choice for a thief. The hardy Dwarf is, as usual, capable of an immense 99 strength; but he's not all that bright and can only cap out at 50 intelligence. A good choice for a fighter. The Bobbit is the obvious choice for your healer, as she can get up to 99 wisdom at the cost of only having 50 maximum dexterity. Finally we have the Fuzzy, who can actually get a maximum of 99 points into both intelligence and dexterity. His strength caps out at a whopping 25, but this makes him the ideal choice for a wizard. On top of the five races, you can choose one of the eleven races for each character. These include the Fighter, Thief, Cleric, Wizard, Paladin, Lark, Ranger, Barbarian, Illusionist, Druid and Alchemist. Some are better than others at certain tasks obviously. A fighter can equip all weapons and armor but gets no magic points. The cleric is your healer and can't equip very much equipment, but can use every will power spell in the game. The wizard likewise, but can instead use every magic spell in the game. Overall, there's a few really useful classes like the cleric, wizard, paladin and lark; a few that aren't bad like the ranger, fighter and druid; and some that are pretty much worthless like the illusionist, thief, barbarian and alchemist. You'd think the thief would be more useful with his inherent bonus to avoiding traps when opening treasure chests, but since any will power user gets the Open spell for only 5 magic points, the thief loses much of his value. Still, these class choices are only my opinion and there is a lot of choice and many different ways to go when playing through the game. There are no inns or areas to rest and recover your health in Exodus, instead you steadily regenerate health and magic points as you walk around. This is providing that you keep stocked up on food, which you can buy in any town. This makes some parts more challenging, and other parts a little easier. For example, if you run out of magic points far away from a town, you can just walk around for a minute and have lots again. However, this makes status ailments such as poison or cold much harder to deal with than usual. They tend to last quite a while in this game, and you steadily lose health for the duration. The world itself is very non-linear - you can pretty much go anywhere you want to right from the start. One major exception to this is sailing around in the ocean, and that's only because there are no ships until you reach level five. After that, pirate ships will be sailing around and you can walk up to one that's near the shore and take their ship after you defeat them. A good tip is to take a pirate ship, then go create some brand new characters at level one and play through the game with them. You still get to keep your ship, but you also get to stick with the easy low level enemies instead of fighting the much harder ones that you find at level five. The ship allows you to travel through the whirlpool to Ambrosia where you can donate money at the various temples to increase your characters' stat points, as well as sailing to towns and dungeons that are unreachable from the continent. Dungeons in Exodus don't have bosses, and the enemies aren't any different than the ones that are on the surface. The whole point in the dungeons is to find the various "marks" to brand your skin with. These include the Mark of Kings that lets you level up higher than level 5, the mark of fire that lets you walk on fire without taking damage, the mark of force which lets you walk on force fields without damage, and the mark of snakes that lets you get past the giant snake in the middle of the map. The whole layout is the old school, 3D looking first person effect where every time you push a direction it changes to the next screen. They're like eight levels deep, maze-like, and require torches or light spells to see where you are going. At low levels the enemies are really easy. If you have a magic user and a will power user, you can pretty much kill all four types of enemies with no effort at level one and two. A magic user can cast the Repel spell for 0 magic points, and about half the time it will instantly kill the majority of Orcs or Goblins all at once. Similarly, a will power user can cast Undead and kill the majority of Skeletons or Ghouls. Both of these spells cost no magic points and can be cast over and over again. Since you don't actually level up until you gain enough experience and go talk to the king, you can essentially stay at a low level for a long time stockpiling gold to raise your stat points and collecting the best gear possible. Enemies don't drop any additional money at higher levels, so there's little point to progressing early unless you want the added challenge. Enemies don't drop anything except for gold either, so it's not like your going to get better equipment by killing stronger enemies. Nearly every weapon and armor in the game is bought from the various towns, and that's all there is to it. The world map in Ultima III: Exodus is fairly decent, reminding me a lot of Dragon Warrior or Final Fantasy. It's a top-down perspective with colorful tile-based graphics, with a smattering of towns and dungeons to be visited. It's easy to tell what everything is supposed to be, but it's definitely nothing ground breaking. They are, however, much improved over the original Apple II version. The background music is pretty memorable, and while I wouldn't go so far as to say it's some of my favorite music on the NES, I don't have to mute the television or pop in a CD or anything to drown it out. The sound effects are the standard fare of early NES beeps and blips though, and while they're befitting the gameplay they wouldn't be missed if you could turn them off separately from the music. The game will take a good number of hours to play through, and with the many options for characters available it does have a little bit of replay value. You won't find much new after the first play-through, but it's still worth breaking out later to play through again. Captain Planet and the Planeteers was published by Mindscape for the Nintendo Entertainment System in 1992. It was based on the animated television series of the same name, in which a group of kids fights to protect the planet from pollution. The group consists of five kids from around the world who are each given a magic ring by the spirit of the Earth, and each ring controls a different element. Earth, fire, wind, water or heart. Usually late in the episodes when the kids are outmatched, they put their rings together to summon Captain Planet himself to come to the rescue. He is fast, strong, and can also fly/hover - but pollution is his kryptonite. The main goal of the game is to stop the evil polluters, poachers, etc and save the planet. The message is good, and it's nice to see a game that at least makes an attempt to stand for something and have some ideals. Unfortunately, the game was executed poorly and wasn't really worth playing. Keeping in sync with the show, each of the game's five levels is split into two distinct parts that play out differently. In the first half you control the kids (although they are inside a jet, helicopter or submarine), while in the second half of each stage you control Captain Planet as he fights to the end to confront the boss of each level. Each portion of the level plays out a little differently, but they share some annoying common elements. For one thing, nearly every enemy will kill you in one hit. For another, there are a lot of narrow little passages that you must somehow try to maneuver through and touching a wall will also kill you in one hit. This game is hard. So the first portion of each level starts you out in a jet, helicopter or submarine and plays like a side scrolling shooter. All the vehicles function the same, only the sprite and the setting change. There are obstacles to avoid, enemies flying at you and on the ground underneath you (and/or surface above you), and you have your five elemental powers as weapons at your disposal to complete the level. Each of the five elemental powers performs a different function; lobbing rocks, shooting fireballs or wavy water projectiles, or creating a shield out of wind. The heart power is more of a gimmick, allowing you to communicate with animals for a couple short, specialized parts in a level. They all detract from the power meter at the top of the screen, and when it's gone you can't really do anything else but die. You can get power-ups along the way that refill a portion of it however. You play the second portion of each level as Captain Planet. It still uses a side view and you still die in one hit, but instead of a scrolling shooter you get to move to the left, right, up and down as you squeeze your way in between obstacles, punch enemies and try to find your way to the end to confront a boss. You can still use elemental powers, but there's not a whole lot to them. If you use wind, you turn into a blob of wind and can pass through gates and such - and water works almost exactly the same way. Fire lets you turn into a blob of fire, but at least you can run through some enemies in this form and destroy them. The heart power is again a gimmick, and I've only found one place to use it in the Captain Planet portion of the game. Most of the time you'll be trying to punch enemies to death while they shoot and kill you. Good times. If it weren't for the unlimited continues this game offers, I'd never have been able to complete it. Also, the continues let you start over from whichever half of the stage you were on (the kids half or the Captain Planet half), so at least you don't have to replay the entire stage. The difficulty is a bit over-the-top, especially considering that it's a game based on a cartoon and would have mostly been played by younger kids. I mean in one snowy map there are the usual narrow passages you can hardly fit through as it is, in addition to the enemies you must watch out for... but then every time you do squeeze through somewhere, a big glob of ice falls from the platform above and kills you. There's a lot of things that aren't consistent or intuitive, and some weapons don't work against some enemies. Trial and error is annoying when it means dying constantly and having to restart the area so much. The graphics aren't terrible, everything is fairly colorful and detailed enough to tell what's what. They're nothing all that spectacular though, and considering how late in the Nintendo's life cycle this game was released I would have expected a lot better. The sound is even worse, with lots of terrible generic blips and beeps that wouldn't have been received well if the game were made 10 years earlier than it was. The theme song from the cartoon and Captain Planet's "The Power Is Yours!" tag line are nowhere to be found either. The background music wasn't very good either and didn't have a lot of variety, but was thankfully forgettable. Muting the television and playing something else was about the only way you could play through more than one level at a time - that is, if you could stand to play that much in the first place. There's no reason at all to pick this game up. The mechanics make it hard to play through, there's not much in the way of story, and it's just not very fun at all. Wizards & Warriors was developed by Rare and published by Acclaim for the Nintendo Entertainment System. It's a game that we picked up when I was a kid due to some glowing review in some random gaming magazine. While it was mildly fun to play on occasion, it really wasn't anything special and in fact parts of it were rather annoying. A side-view platformer in the strictest sense of the word, Wizards & Warriors revolves around climbing and jumping from one platform to another as you work towards the end of each level. There are a few RPG/puzzle elements thrown in, such as collecting a few different items to help you progress or locating different colored keys to open the corresponding chests and doors. Unfortunately the story is cliche, having an evil wizard kidnap some maidens; and you, as a brave knight, are tasked with defeating him and rescuing the maidens. Oh yay. One of the first things you notice is that the collision detection and the method of attacking leaves much to be desired. Swinging your weapon just feels off, and half the time it doesn't seem to make contact with the enemies anyway. This is only compounded by the fact that you are constantly swarmed by annoying little flying enemies who usually respawn as soon as you kill them, leaving you flailing about wildly with your sword and getting hit anyway. You can also just run or jump through most enemies without swinging and they will still fall to your sword, which just seems like a hacky work-around that was tossed in to offset the bad swinging mechanics. The graphics themselves are decent, having enough detail to easily distinguish what each item is and tell enemies apart. However, many of the designs and color choices lead me to believe the designers were on an acid trip. I mean honestly, we have things like neon pink spiders and one enemy that looks like a blue yeti with a dog's head. Some of the scenery looks nice, especially parts of the cave levels, but again the layout and color choices in places is bewildering. Random locked doors stuck in the middle of tree trunks, platforms tossed about haphazardly, etc. There's also a limited amount of variety to the levels; you have cave levels, forest levels and castle levels at the end. They're all pretty similar and there's really nothing unique about any individual level. There's also a lot of maze-like scrolling and climbing, searching for keys to go in doors and search for more keys, back-tracking in circles... it gets tiresome and really detracts from the gameplay. On top of that you have to collect gems laying around the levels or in treasure chests so that you can bribe the guard on each level to let you continue to the level boss. By time you're on the last level, this is a really obnoxious and time consuming process. The bosses vary in difficulty, but are overall pretty balanced and fun encounters. I actually liked the background music in Wizards & Warriors, it's one of those games who's music just sticks in my head many years later. Dark and baleful, it helps bring about the sense of urgency and danger that you would expect if you were tasked with saving the world. The sound effects are most average, but usually befitting the situations they are used in. Being a NES game, there's really not much to write home about in the way of sound to begin with though. One last thing to note is that the constant swarm of enemies flying around you coupled with the buggy swing mechanics would normally make this game ridiculously annoying and hard to play. I guess their way of solving that was to give you an unlimited number of continues right from the start. You continue from whatever level you last died on with your complete inventory intact, so even if the game gets to be too much you can always just push through it given enough play time. Overall, I was disappointed with Wizards & Warriors as a kid and even more so today. It's slightly below average across the board, except for the background music. I wouldn't bother picking it up as there are much better action/platform games available for the NES like Darkwing Duck or any of the Mega Man games. "Thou hath rescued thy princess. Thy search hath ended." Thank goodness. 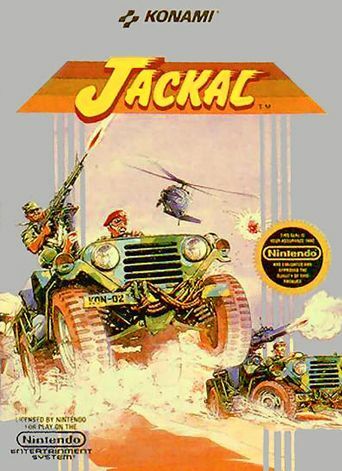 Jackal is a game that was developed and published by Konami for the Nintendo Entertainment System. It was originally an arcade game, and it was known as Top Gunner in North America. It's a fairly simple game based on driving around in an armed Jeep rescuing prisoners of war. Along the way you'll have to dispatch many enemy soldiers, tanks, fixed-position turrets, helicopters and a few other enemies. To accomplish this, your Jeep is armed with a little gun as well as a grenade launcher. The gun only fires directly up on the screen, while the grenade launcher fires in the direction your Jeep is facing. The gun isn't really all that useful, and can not be upgraded, so you mostly only use it to spray at the occasional ground troop. The grenade launcher on the other hand is much more valuable, and you can upgrade it to a rocket launcher, and then upgrade it again so that the rockets kind of blow up in a cross shape when they explode. The prisoners of war are all held in various buildings; you just blow up the building with a grenade/rocket and then stop beside it to let the prisoners walk out and climb into your Jeep - though strangely the Jeep is able to hold dozens of these guys. Some buildings will have a single prisoner of war who is flashing in color, and rescuing him is how you upgrade your grenade launcher. Three flashing prisoners will fully upgrade you to the maximum range rockets with the spread out cross-shaped explosion. These are really handy, as you can shoot beside an enemy and have the explosion take him out anyway, even through walls. You can also just drive your Jeep over foot soldiers to kill them, though this obviously doesn't work on tanks or anything else. The six different stages are all pretty similar, though the setting is varied enough to not make it too monotonous. There is a swamp stage, one inside a base with an airfield, another that looks like ruins, etc. They are all presented in an overhead view and are all pretty linear. While there's a limited amount of scrolling as you drive from left to right, the bulk of the map always starts from the bottom of the screen and you head up to progress. After a few minutes of fighting and rescuing, you come across a helicopter pad where you can drop off your rescued prisoners and have points added to your score for each one. At certain score levels, you'll be rewarded with an extra life, and you may just find yourself needing them if you haven't played the game twenty times before. After you drop them off you will find a boss battle just ahead, and defeating the boss completes the stage so you can move on to the next one. Bosses are varied, ranging from destroying a few tanks, to taking out a helicopter or a battleship, to destroying an enemy base with multiple fixed-position turrets while destroying or dodging tanks and ground troops. Most of them aren't too difficult, but some (especially the last one) can provide a challenge. The difficulty is pretty well balanced, the first level is pretty easy and it increases as you progress. Enemies start shooting more bullets at you, you start running into new types of enemies and they increase in number. It gets harder to avoid taking the occasional death, and dying resets any weapon upgrades you may have gotten back to the default grenade launcher. There are a few of the flashing prisoners in each level though, so you do usually at least have the ability to work your way back up to the better rockets prior to the boss fight unless you die near the end of a stage. When you die, you reappear in the same place and your Jeep will be flashing colors to signify you are immune to damage. This effect lasts around three seconds. There is also a two player cooperative mode where you can play with a friend. The first player will always have a green Jeep and the second player will always have a red one. You both drive around on the screen at the same time, which makes the number of enemies easier to manage, but gives you less points per person when it comes to raising your score to obtain extra lives. You also have to get by with the same number of flashing prisoners for weapon upgrades, so it doesn't make the game so much easier that it's no longer a challenge. Usually when one of us rescues a flashing prisoner for the weapon upgrade, we let the same person grab the next couple of them as well so that we have one maxed out rocket launcher because it's much more helpful than each of us having a lesser upgrade. As long as you can stay alive it's a simple matter to let the other player grab the next few and then you're golden. As I said before, Jackal is presented in a top-down, overhead view. The graphics are actually not bad for an old Nintendo game; the enemies are mostly detailed (except for the foot soldiers, who look rather like little white stick figures), the stages are varied in design and what few animations are in the game look smooth. I do wish the bullets fired by an enemy were a different color than the ones you fire though, especially when you're playing two-player and there are a lot of them on the screen at the same time. It makes it a little more difficult to avoid dying and losing your precious rocket launcher upgrades. The sound isn't all that spectacular - the background music is pretty much the same through the entire game. It is upbeat and exciting, but there's really no variety. It does pick up in tempo a bit more during boss fights, but that's about it. There's also the scratchy rocket launcher sound, a mild explosion sound when you hit things, the standard helicopter sound when one flys by overhead, etc. Not a lot, and not much variety here either, but it's sufficient to add to the gameplay rather than detract from it. There's not a whole lot to Jackal really, it can be played through in about an hour without much difficulty. Due to the length, there are no save games or stage selection screens; you just play through from beginning to end in one sitting. If you do lose all of your lives, you can choose to continue from the beginning of the current level and keep playing. You get up to three continues in total, and then you have to start over from the beginning of the game. All in all, it's a pretty fun game that I've had a lot of fun playing over the years. It still gets played every year or so like most of my Nintendo games. Like Contra or Ninja Gaiden, it's not too long and involved; which makes it easy to find the time to play through it when you're feeling that nostalgic itch. I've had my copy for many years, but you can still find a used copy on eBay for around $5. Well worth the money.